I have been busy these last few weeks sewing pillowcases. I have found that making pillowcases is a great way to use fabric in my stash. I construct the pillowcases using the roll it up pattern found on the Million Pillowcase web site. On Monday, I delivered 30 pillowcases to 35th Avenue Sew and Vac, they collect pillowcases for Back to School Clothing Drive. 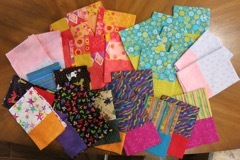 I will continue to go through my stash and will be making more pillowcases, I will keep you posted on my progress.